The life of “possibly the greatest, and certainly the most famous, diplomatic historian of the twentieth century,” by a former research student now teaching at London University. Taylor may already be receding into the mists of history, the very mists he did so much to dispel, but Burk ably captures not only his importance but also the flavor of his pugnacious and epigrammatic style. In his history of the Habsburg monarchy, Taylor was the first to use the archives of three countries, and he loftily wrote off the Cambridge History of Foreign Policy as “now completely out of date.” He produced many major works of diplomatic history and hundreds of essays, but he also irritated his less productive colleagues by writing some 1,600 book reviews and becoming the first “television don”—delivering one or more series of lectures, by himself and without notes or prompters or film footage, every year for ten years. His contention that Hitler should be seen not as an aberration but as part of the pattern of German statesmanship stirred up a profound controversy—which Taylor relished. He dismissed a criticism by the Regius Professor of History at Oxford that his Origins of the Second World War would harm Taylor’s reputation as a serious historian by retorting that the methods of quotation used by the Regius Professor in his review would harm his own reputation as a serious historian “if he had one.” Taylor’s great contribution, one that influenced a generation of diplomatic historians, was to emphasize the fundamental and enduring influences in the behavior of states, and to pay less attention to accident and chance. Taylor himself thought his life unimportant, and Burk can’t quite persuade us that it’s worth covering in this detail. 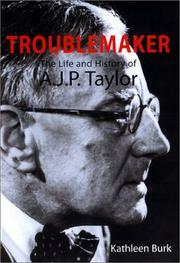 Still, Taylor’s contribution to the intellectual history of this century makes this account fascinating and valuable.